Staff photo by TOM KING New Hollis Brookline baseball coach Rich Loftus is hoping to have a focused team for the 2017 season. HOLLIS – The new coach at Hollis Brookline High School is very old school. There’s been a changing of the guard on the diamond at Hollis Brookline. Alum Ryan Coulter had guided the Cavalier baseball program for 18 years, but the administration ultimately – without revealing why – decided that it was time for a change. Enter Rich Loftus, a former Nashua South assistant who is ready to carve out his own program. But make no mistake, the 60-year-old Loftus will do things his way, and that way is a very traditional one. Loftus has wanted to be a head coach for a while at the high school level. 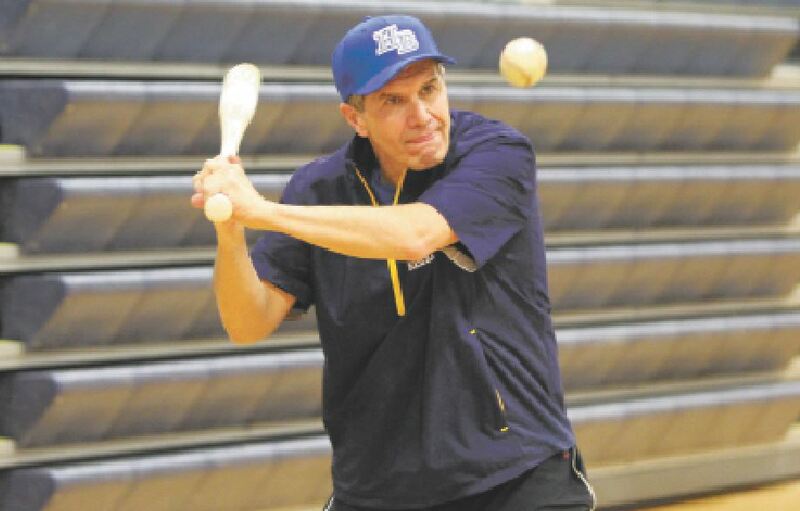 A para educator at South, he owned the indoor/outdoor Nashua Baseball Academy in Hollis for the last dozen years before recently selling it, although he’s staying on to help run it for a year. There he ran and coached an AAU program, the Nashua Knights. In fact, the Cavaliers would work out at the Academy in emergency situations. Also, he’s been a unified soccer/basketball coach at South. So we’re not talking about a coaching novice, here. But while baseball has been part of his whole life, we’re also talking about a Haverhill, Mass., native who didn’t play college baseball but rather was a two-year captain as a linebacker/fullback at Fitchburg State. But his wife objected to their sons playing football, so Loftus’ time coaching began in local youth baseball circles. Thus he’s certainly no stranger to the local baseball community – and many of his current players. That familiarity has been huge. “Most of them played in my AAU program when they were 12, 13, 14, so I know a lot of them,” Loftus, who also had been in food service sales for some 25 years, said. Corsetti said the offseason change caught some players by surprise when they first heard about it a few months ago. Over the last 18 years under Coulter the Cavs won one state title (2007), been to two finals, and were in the Division II semis as recently as 2014. But they are focused on moving ahead. Loftus started the Baseball Academy because back in 2004 to basically create his own indoor facility for his sons to play, as there weren’t any in the area at that time. Loftus knows that coaching high school players is an art all to itself. “You have to respect them, you have to treat them like young men,” he said. “You have to expect them to be young men, be decent citizens and contribute to society. And they get that. What kind of teams does he want to have? It’s pretty simple, he says. Loftus said his Cavaliers will embrace small ball and practice it, but he loves a power team with sluggers as much as anyone. He’ll go by what he sees. The Hollis job was a natural fit for him as he teaches in the area, knows the players, and now he’s looking forward to having fun. And thus, the Rich Loftus Era for Hollis Brookline baseball is underway.